Xiaomi started off as a smartphone company, but has diversified into a whole lot of products ranging from the sublime to the ridiculous. On the one hand, you’ve got devices like the Mi TV and the Mi Box that are widely believed to be some of the best products in their respective categories, while on the other, you’ve got devices like smart pens and smart umbrellas that leaves you searching for words. Oh, and don’t forget the smart kettles and mosquito repellents either. Now a new product is joining that seemingly ever-expanding list, with the announcement of a digital thermometer hygrometer in China. The Xiaomi Digital Thermometer Hygrometer is packed with Swiss-built digital sensors. 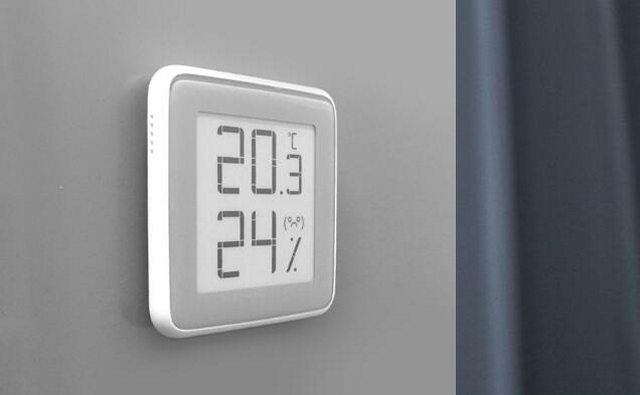 It displays the temperature and relative humidity of your room on its monochrome e-ink display. The company claims that it can measure temps accurately to within 0.3-degrees Centigrade and relative humidity (RH) to within 3% of the actual figure. Users can also change the settings to display the temperature in Fahrenheit if they want. Built out of ABS plastic, it measures 64.5 x 64.5 x 9.7mm and its battery is rated to last a year, according to Xiaomi. What’s even more impressive is that it is priced at just 59 yuan, or about $9 and Rs 580. Sadly, though, as with many other Xiaomi products, the thermometer hygrometer has only been launched for China, and it isn’t clear if the company intends to launch it elsewhere going forward.